This photo is an outtake from the visit to Sainte-Nazaire in France that resulted in my 2010 post Musique Concrete. 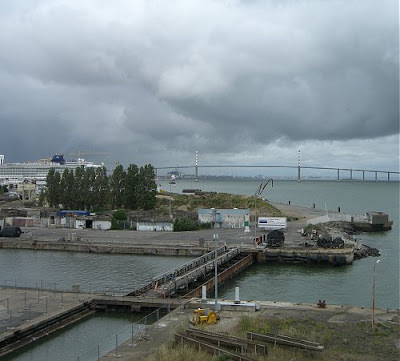 In the background is the famous Sainte-Nazaire bridge and on the left is a cruise ship being fitted out in one of the city's dockyards. I remember wondering at the time what would happen if one of these ships fell on its side. And let's not forget the many connections between classical music and cruise ships.